Matt Basile and Kyla Zanardi’s take on this south-of-the-border specialty includes a sparkling wine sausage gravy, just saying. While it’s less of a mainstay here in Canada, ‘biscuits and gravy’ is a staple you’ll spot on breakfast menus especially across the American South. Originally favoured for its filling and frugal nature, the dish now embodies all of our ideas of what comfort food should be: hearty and satisfying with a dash of indulgence. Matt Basile and Kyla Zanardi’s take on the speciality, which comes to us from their new cookbook Brunch Life, is no different. 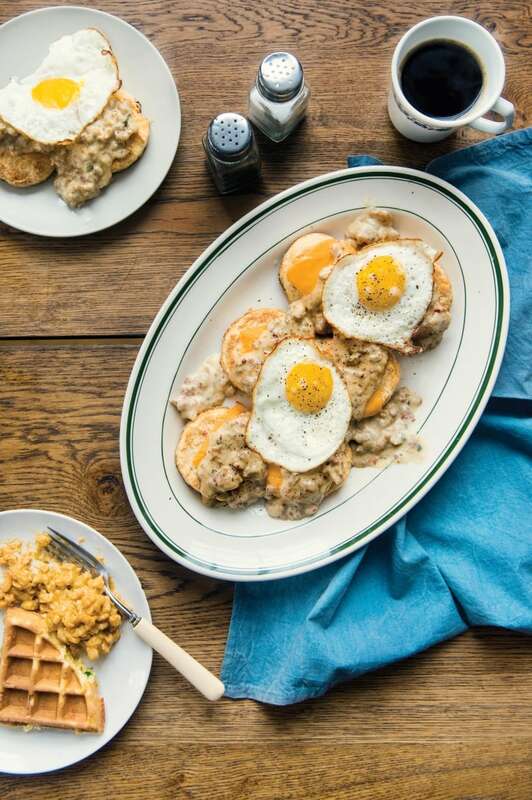 Using fluffy, homemade biscuits as a base for sliced cheese, sparkling wine-infused sausage gravy and sunny-side up eggs, it’s the ideal dish for impressing brunch invitees, or turning a lazy Sunday with the fam into something special. I think Ky and I ate biscuits in every single city we visited while researching for this book. Nashville biscuits were smaller, light, and fluffy little beauties served with jam and butter. Seattle had a much heartier version that was filled with so much gravy we almost couldn’t tell they were even on the plate. San Fran’s sat somewhere in the middle: super light and fluffy but way bigger than the ones in Nashville and filled with beautiful, beautiful meat. I have a few takes on biscuit batter throughout this book, but none more satisfying than this brunch icon. Making a biscuit, baby: Preheat the oven to 425°F (220°C) and line a baking sheet with parchment paper. In a large bowl whisk together the flour, sugar, baking powder, and salt. Use the large holes of a cheese grater to grate the frozen butter into the dry ingredients. Crumble the grated butter and flour together with your fingers until the mixture resembles pea-size crumbles. Add the milk and hot sauce and mix everything together with your hands until it just forms a dough. On a lightly floured surface, roll out the dough until it is approximately 1 inch thick. Use a 2-inch round cookie cutter to cut 4 or 5 biscuits out of the dough. Place biscuits on the prepared baking sheet, leaving an inch or two between them. Bake for about 12 minutes, until golden brown. Transfer biscuits to a rack and allow them to cool to room temperature. Release the meat: Heat a large saucepan over medium-high heat, then add the sausage meat. Break the sausage into small chunks with the back of a wooden spoon and cook, stirring frequently, for 4 to 5 minutes, or until it is cooked through and starting to brown. Use a slotted spoon to remove the meat from the pan and set it aside in a bowl. Melt the butter in the pan, then add the flour, stirring with a wooden spoon to form a thick paste. Add the sparkling wine, chili flakes, and salt and whisk to incorporate. Turn the heat down to medium-low and slowly add the milk while whisking constantly, until it starts to thicken. Return the cooked sausage and turn the heat back up to medium-high. Continue stirring constantly as the gravy thickens, about 5 minutes. Remove from the heat and keep warm. In a medium frying pan, heat the canola oil over medium-high heat. Crack the eggs into the pan and turn the heat down to medium. Cook the eggs sunny side up for about 5 minutes. That’s biscuit, baby: To serve, slice the biscuits in half and top each half with a slice of cheddar. Ladle the Sausage Gravy over the cheesy biscuits and top each serving with a sunny-side-up egg. Garnish with chopped sage.